What an awful saying "killing two birds with one stone" really is when you break it down. I was trying to explain to Anna the figurative meaning of the saying, but being 6 years old she couldn't quite get past the literal meaning. But why mummy? You said we should never hurt animals. Why would you want to kill a bird with a stone? Ahh, to be six years old again with such an innocent outlook on things! So let me try this in a PC way: my latest project achieved multiple outcomes whilst utilising a streamlined approach to achieve maximum efficiencies (I have told you I work for the government right? We excel at jargon like this!). Not only did I end up with a lovely top to wear, but I also used up two separate pieces of scrap fabric and used a previously unused vintage pattern from my rather large stash. A win any way you say it! After I made the Simplicity dress in the last post, I had a large-ish bit and some odd shaped bits left over of the houndstooth fabric. Keeping in mind my recently self imposed rule of trying to use up fabric scraps in a meaningful way rather than hoard them, I decided to make this quick top instead of tidying up my sewing room after the dress project (which is my other recently self imposed rule!). I paired this fabric with some black knit fabric leftover from long ago project, because I didn't have enough of either fabrics but together I managed to eek out this top, albeit with shorter sleeves than the pattern is designed for. 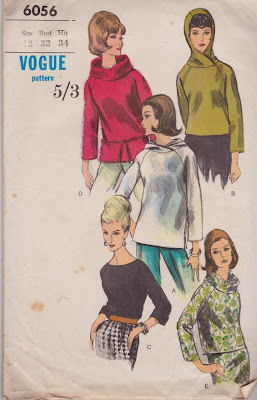 It seems that practically every pattern company these days has a raglan pattern but what I like about this vintage Vogue pattern is that it has a bust dart to give some subtle shaping whilst still being a boxy, casual style. The pattern was designed for woven fabrics, and has a front and back facing at the neckline which I substituted with a neckband since I was using a knit fabric. It's a one piece raglan sleeve, with a shoulder dart to give a bit of shaping which seems to sit well enough on my narrow, sloping shoulders. Overall it was a super quick and easy top to make, but is great for my more casual days and it means more fabric out of my sewing room and into my wardrobe. Something a little different from me today - I'm participating in a 'Dress Up Party' hosted by Sara over at Sew Sweetness and have written a guest post reviewing Simplicity 2724. This is a great dress which has been made by lots of talented sewers, but for some reason it's now OOP. If you have this in your stash I can highly recommend making it up. I've made my version in an emerald green cotton for the bodice and a black and white mini houndstooth wool for the skirt. It was fortunate that I had this commitment to meet because it forced me to finish this dress - I had a hugely productive sewing weekend away a few weeks ago but lately my life has been a black hole of busyness, sickness and a stint of solo parenting which has been hugely draining on my sewing mojo and I haven't had the energy (or time) to get much done. Hopefully this can get me back on track - so many things to sew and so little time!